As a part of its responsibility to the marine environment at the Gulf of Aqaba, the only sea outlet in Jordan, Jordan has joined the world in celebrating the International Year of the Reef (IYOR2018). 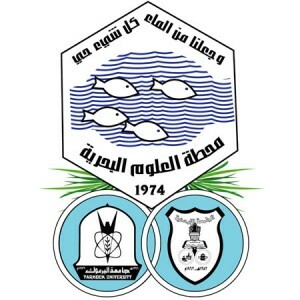 The Marine Science Station (MSS), the research institute in Jordan located on the Gulf of Aqaba -Red Sea, has held a ceremony in celebration of the IYOR2018, under the patronage of H. E. Mr. Nasser Shraideh, Chief Commissioner of Aqaba Special Economic Zone Authority (ASEZA), at the InterContinental Hotel in Aqaba on 28.11.2018. 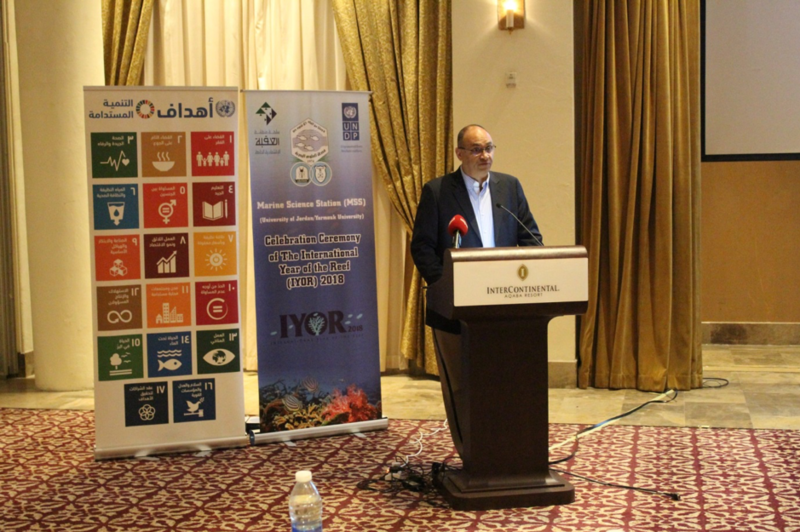 The event was sponsored by the United Nations Development Program (UNDP)-Jordan. Coral reefs are a key part of the Gulf of Aqaba, they support a major part of subsistence needs and the tourism economy in Aqaba; in addition to providing a natural wall of protection from erosion, they are strongly linked to the tourism attraction part of Aqaba city. The Marine Science Station (MSS) assist Jordan and local authorities in strengthening coral reef management capacity. 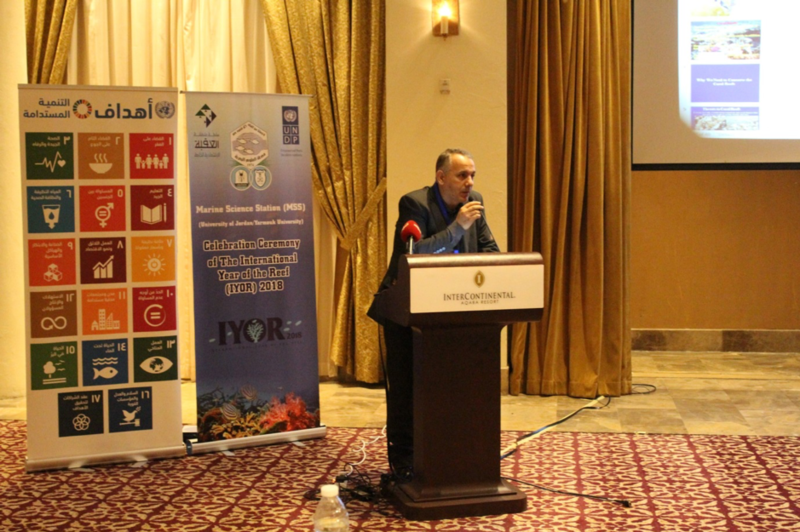 By celebrating the IYOR2018, the MSS announces its recognition of the beauty and values of the Gulf of Aqaba as a part of the Red Sea and reminds the responsible authorities of the immense work needed to address the increasing problems of climate change and human behavior and their impacts on coral reefs as hosts of marine life and ecological processes in the Red Sea. 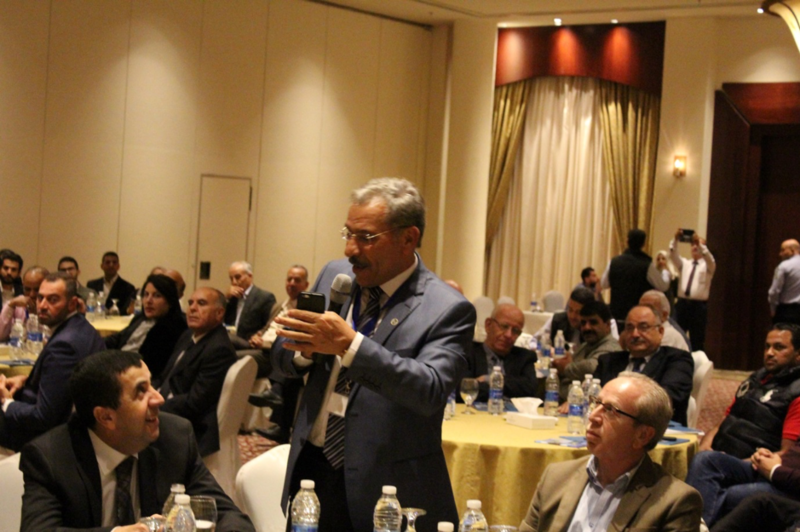 Attendees of the event were stakeholders, NGOs, community bodies, and decision-makers in Aqaba city. All attendees showed their full support of the efforts being done to protect coral reefs along the Jordanian coastline. The celebration was opened with speeches from Dr. Ali Al-Sawalmih (MSS Director), Prof. Musa S. AL-Lozi (Vice President of the University of Jordan (UJ) for Centers and Community Service Affairs/ President of UJ-Aqaba Branch), Dr. Nedal El Ouran (Head of Environment, Climate Change & Disaster Risk Reduction, UNDP), and finally H. E. Nasser Shraideh (Chief Commissioner of ASEZA). All of the opening speeches emphasised the importance of the coral reef ecosystems, and how important it is to work together to help them now, as they are under huge stress from climate change and from direct human activities along the Jordanian coast at Aqaba city. 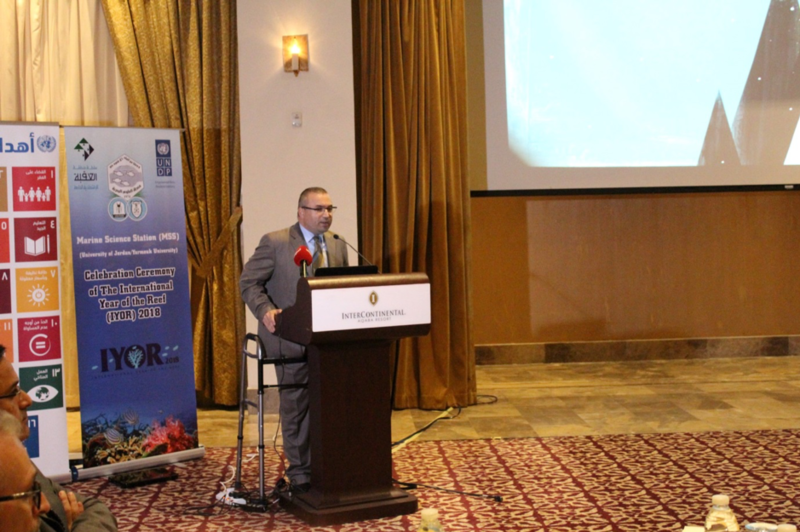 Success stories about saving coral reefs in Aqaba were presented during the event. The first showed the project performed by ASEZA for transplantation and relocation of coral colonies from coastal construction area to the coast of the Aqaba Marine park, a bioreserve and fully monitored to prevent any activities that could cause any damage of the reef. This project was very encouraging; the recorded survival rates were relatively high at all transplantation sites (89.9%). 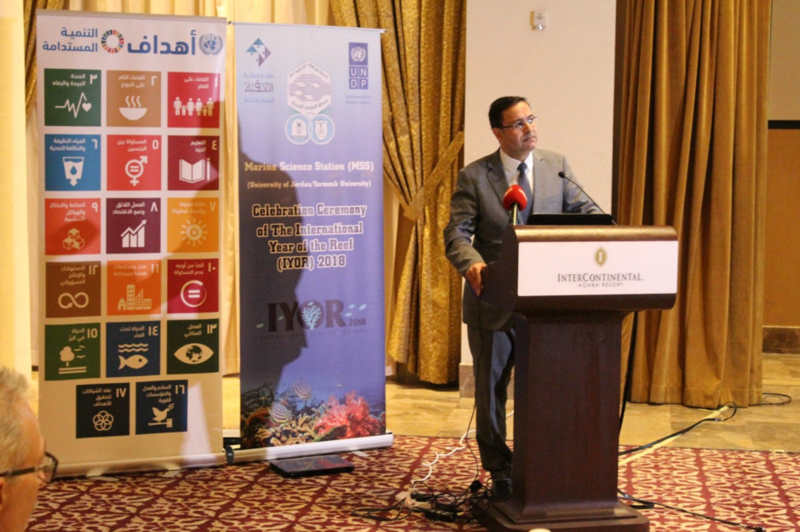 This story was part of the project “Mainstreaming Marine Biodiversity Conservation into ICZM in Aqaba” which is funded by the Global Environment Facility (GEF), and United Nations Development Program (UNDP). Eng. Sahl Dudin, Managing Director of Ayla Oasis Development Co.
Another success story was presented by Eng. Sahl Dudin, Managing Director of Ayla Oasis Development Company. Many artificial reefs were deployed at Ayla lagoons three years ago, and now they became a very attractive dive sites at Aqaba with their beautiful coral reefs transplants. This plays an important role in decreasing the diving pressure on the natural reefs sites and creating new habitat for marine organisms. The final presentation was given by Prof. Fuad Horani (Faculty of Marine Sciences, University of Jordan, Aqaba) showing the procedures and techniques they used in the laboratory at the MSS and in the MSS coast to help in protecting the reefs, and to restore any damaged part at the Jordanian coast. At the end of the celebration ceremony, the disscussion was opened to all the attendees, to ask and give any suggestion for future work or enhancing the current projects. For more about the event see the MSS Facebook page.